In 2016/17 South West Trains (SWT) passenger were forced to pay 16.6p per mile travelled more than the cost of running the service. (The overpayment totals £662m.) Passengers on Southern trains paid 10.5p per mile more than the cost of running their service. At the same time passengers in northern England, Scotland and Wales receive huge subsidies, up to more than 40p per mile. With rail passengers facing the largest fare increases for five years, new analysis by the Southern Policy Centre reveals how the burden of paying for the UK rail system falls unfairly on passengers in central southern England, who are being forced to pay a premium in order to reduce ticket costs for passengers in other parts of the UK. (1) The net franchise payment or subsidy measures how much passengers pay, or are subsidised, for the basic running costs of their service. In 2016-17, every single passenger on South West Trains paid the government 16.6p per mile more than the cost of running their service. This was up 16% from 14.3p in both 2014/15 and 2015/16. The total subsidy paid was £662m – which accounts for 55% of the entire total subsidy paid by operators of £1.19bn. On the same basis, Southern rail passengers paid 10.5 per mile ‘too much’ in 2015-16. (A change of ownership after 2015/16 means comparable figures for the most recent year are not available). By contrast, passengers in the north, Scotland and Wales received subsidies of between 8p and 17p per mile, amounting to a total cash subsidy of £625m. 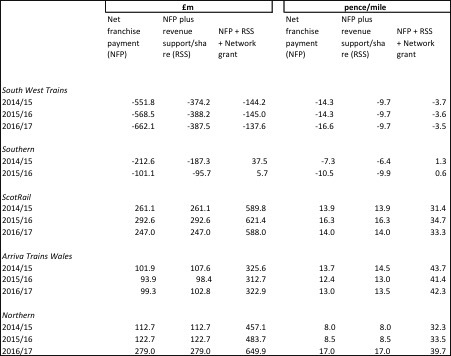 (2) The revenue support/share is a payment made by or to the TOC depending on whether the company does better or worse than the franchise agreement. In 2016-17 SWT was paid £275m by the DfT. Passengers do not benefit directly from this payment, but the SPC analysis shows that even if it is regarded as a subsidy, SWT passengers were still paying 9.7p per mile more than the cost of the service. (3) Finally, the DfT makes network grants to cover the capital costs of improvements to the rail system. In most parts of England, Wales and Scotland, this is a direct public investment in the rail system. But in central southern England, passengers are required to pay for the cost of the capital investment too. SWT passengers paid 3.5p per mile more than the running and capital costs of their service. Including network grant, Southern passengers received a tiny subsidy of under 1p per mile. 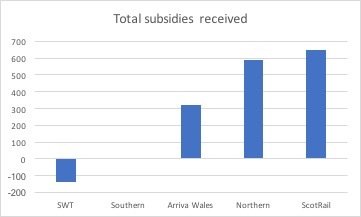 In contrast, passengers on Arriva Trains Wales rail services received subsidies of over 42p per mile.